I've been on a changing journey in the studio. It’s mostly been about my students. There are four at the moment, individually taught, and each is on a different path from the others. I really enjoy their unique approaches to clay and their personalities. Here’s a glimpse of one sculptural work by a gifted student. Bisqued, glazed but not yet fired- stay tuned for glazed sculpture “after”. Student work. So good!! Meanwhile, last week I took a long look around my gallery, adjacent to my studio. So much nice work to sell- yes, I do think so!- and most of it is one-of-a-kind. Often they are related to a color or shape group, but they are still all individuals. And I am not working on more of these very much at the moment. The shelves are full enough and groaning. The pots will only be in the gallery till they sell, probably not to be replaced… Because I am working on a changing roster of other sorts of pots. These are sometimes bigger or more complicated than before, and sometimes from my gut instead of from the roster of “pottery I make”. Even though I love “pottery I make”. It was time and more for a change. For example- I have a related (but not exactly the same) grouping of bowls, sgraffito color on black. I’m still exploring the rarified world of chanukiot (menorahs), now better adjusting the bodies for level stance and greater surface complexities. This study continues to be an evolution of changes! Surface color and sgraffito is all over this chanukiah. Starting tomorrow and following daily except Saturdays- check Mimi Stadler Pottery on Facebook for a special look at individual pieces, under the category of “Does it speak to you?” You can always DM me if it needs to be yours. Posted on February 11, 2019 by Mimi Stadler. For the first time, in 2018 a "pot swap" of a piece not larger than 6"x6"x6" is going to take place. 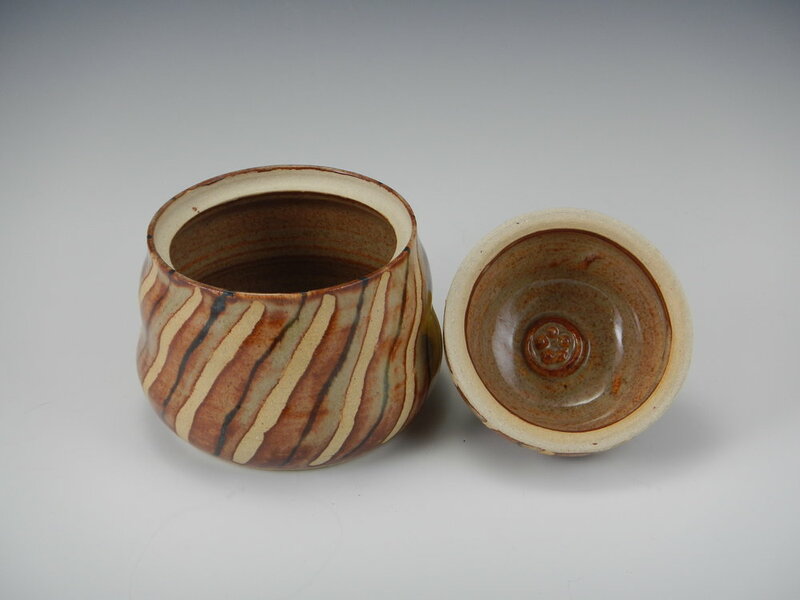 This is my piece, called Treasure Jar, electric-kiln fired and earthy. I'll get my swap for it on Wednesday! The drive down to Virginia on Sunday was long. Susan drove (it's her car) and Beth, Tzu and I rode along as passengers. It took 9 1/2 hours with a couple too many stops, but here we are. Anticipation was high. Susan and Beth and I have been to this symposium before. Tzu has not, but she is just as psyched as we are. Now that we begin Tuesday, Day 2, it's time to recap Monday, Day 1! Monday morning after breakfast, with the symposium registration hours not over till 4:30 pm, we four took a drive to Floyd, VA, about an hour away. That was explore an interesting place. Floyd is a spread-out town on rolling hills, sparsely populated but with a surprisingly high concentration of artists of one kind or another. One administrator/artist we met at the art center there theorized a notion that Floyd is in a convergence spot of ley lines, like Sedona, Arizona. Whatever the reason, Floyd has creative energy in the air. Back at Hollins, we had our introduction and outline of the symposium events from artist, teacher, founder and organizer Donna Polseno, who has fed my WWWCS habit for several years now and to whom I send a metaphorical hug all year for it. People were meeting and greeting each other. After dinner we met our opening keynote speaker, Winnie Owens Hart. Artist, educator, author and critical thinker, as Donna described her, Winnie is also funny as all get out and outstandingly honest to boot- an excellent thing in a clay artist (or anyone). She has spent years of both physical and intellectual concentration growing to understand, celebrate and work in pottery, particularly in immersion and scholarship drawn from the African cradle of this very old craft. The traditions remain in their home areas in Africa, still being passed from mother to daughter. It was an extremely accessible presentation because Winnie lived the things she talked about, and her images and descriptions gave visual aid. Ms. Hart Owens wanted us to think about what we think we know, and what is it that we need to travel to other places to know. Winnie advised us to go out and see the world. A myth, she said, is a fantastic story that impressed you when you were younger, but when you got older you found ridiculous. In her way she has explored myths and realities, in her travels and in her art. She talked about her own journey, from her origins in the southern US, on through a great deal of time spent in Ghana and Nigeria and Burkina Faso, and the clay-working women she got to know in those places. She taught there and learned by helping make pottery, and photograph and chronicle pottery making and the people who did it. Back in the US, so that Winnie could have her own say in what she made from clay, she decided she was not going to make her living from making clay work, but would make it from teaching instead. That way she would not be bound by the necessity to make particular objects when she did do her work, but explore her own path. As a result, she went to teach at Haystack in Deer Isle, Maine, 24/7 to work- "and I was there all the time", she told us. Briefly: She is interested in work. Her work has been influenced not just by the African roots of pottery, but by the historical experience of evil and intolerance in the world, including the oppression and cruelty levied by self-named "religious people". We saw work referencing enforced genital mutilation of girls, which happens across a number of cultures and places, for example, and a we saw the image of her pot showing the lynching of black men all around the rim and using symbols of hate on pot's surface. Considering the seriousness of the important topics covered, Ms Owens Hart presented with wit and humor. Best of all- this is what you want from a keynote speaker- the keynote speech was thought provoking and maximally engaging. Posted on June 12, 2018 by Mimi Stadler. Two wheels, one a motorized Lockerbee kickwheel (two options, electric power or kick power) and one a Brent electric. A slab roller, 48x36 inches of clay-rolling capability, with two canvas cloths on top and two knurled (like that word, "knurled") metal rollers, plus a a ship's wheel handle to turn the rollers. Plenty of boxes of clay, most fresh (in boxes in the corner), some old and long unused (under the slab roller table) which lately I've been reclaiming to workable consistency 25 lbs at a time, and some there for no good reason any more (under the work table in buckets, rock hard and dry- and they need to go out). Two kilns, one I use a lot (digital controller) and one I hardly use (the old one with a manual turn-up and junior cone system, which I use in crunch time for bisque firing when the other one is in use). Tools. Jars and small buckets and mugs and big containers full of all sorts of tools. Throwing tools. Glazing tools. Carving, cutting, rolling, texturing, joining and shaping tools. Glaze ingredients. Buckets of powdered ingredients. Their names are a language of its own: Dolomite, flint, talc, gerstley borate, wollastonite, kaolin, frit, Cornwall stone, nepheline syenite. A cabinet of more ingredients in bags and jars: glassifiers, opacifiers, stiffeners, melters, and colorants like powdered stains and carbonates and oxides. Buckets and buckets and bags and jars of ingredients I bought and a few, inherited. And pages of glaze recipes to be tried, or recipes that were tried and good enough, or recipes tried and great. The ones I use are in a yellow contractor's book that has wipe-down pages. Buckets and buckets of glazes we've made from recipes out of those powders, my sometime helpers and I. Full buckets, half full ones, ones that need refills again, ongoing. Buckets of glazes in ten or twelve colors. Raw glazes in the buckets like muted pastels. After heating on the pots to over 2200 F they will be red, blue, cream, green, caramel, nutmeg, clear, and still more- they overlap to melt into additional colors. A scale and stirrers, sieves and pourers, toilet brushes (never used on toilets) for stirring the glazes after they settle in the buckets leaving a layer of water at the top and the other ingredients settled into the bottom. The tiny-particle-loving vacuum, my trusty Nilfisk (goes by "Nils"), that gobbles up the bits and dust and splashes of dried clay and glazes. And the all purpose, industrial, frequently rinsed mop and bucket whose use keep me breathing without fine particulate settling into my lungs and those of my students and "date nighters". The sink- that's a hub! Water that keeps things going, the sink holding big cleaning sponges always in use, a basket of measuring cups and pitchers and cleanup scrubbies, dirty then rinsed out small towels and glazing tools, brushes and rubber gloves. Below, a plaster trap before the u-bend of the pipe, to catch all that clay and glaze sediment we try not to let go down the drain but that sneaks down anyway. The air smells of clay, a faint damp dusty smell coming from everywhere but especially the water buckets at the wheels, where my students and I use plenty of water to throw lots and lots of pots. The odor emanates just as much from the reclaim bucket of wet clay scrap beside my wheel and its overflow partner, the bucket of reclaim standing below it. Both are full in busy times for twice weekly emptying and reclaiming of the slightly pungent mess inside them. If I leave them longer, they start to reek. The plaster batts, for laying out the wet 'reclaim' scrap to be dried enough to be kneaded again to working clay consistency- the batts live in a crate beside the clay in the corner, often not drying out thoroughly for weeks at a time. The romance of clay! Is there romance in an ambience of mud, grit, tools, and cleaning supplies? The studio is a grind, a joy, a contradiction ending with creation. 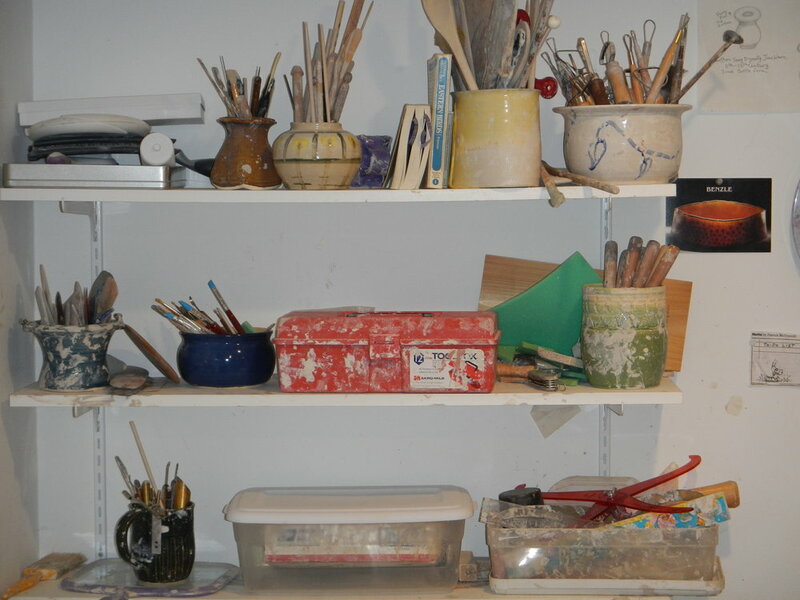 Clay studio: even the neatest is-- a serious, messy workshop. Posted on May 22, 2018 by Mimi Stadler. Notwithstanding another 6" of snow coming our New Jersey way, Happy Spring! Nothing is sleeping at the pottery studio and gallery here. So many things are happening! You can now follow me on Instagram at Mimi Stadler Pottery, and I am on Facebook, same name. "Follow, follow, follow!" as the song in the Fantasticks went. You can find more works added to my website with each glaze kiln that I fire and unload. My students are growing in skills steadily and exploring an expanding world of ideas. Date couples have been in and out of the studio, having two hours of fun and getting their own finished work back a few weeks later. The studio is full of pottery drying, pottery bisqued and waiting to be glazed, pottery in the midst of the glazing process, and pottery going into, being fired, and coming out of the kiln. The gallery and website are filling up and are then getting thinned out again by purchases. So... follow me on Instagram! And Facebook! Please bookmark and check back to my website now and then. Because you never know what you might find! Posted on March 20, 2018 by Mimi Stadler. Website analytics is an interesting thing. I want to know, Who's looking? Where are they from? Are they coming back to look at more? I get lookers from Ukraine, Ghana, The Philippines, Israel, Germany, England, Korea, as well as others... and all over the U.S., too. I was in North Carolina lately and left my card with various potters. Lots of hits from NC after that. Lots of hits always from New Jersey, my home state, probably because my metadata on the website says (among plenty of other things) "NJ pottery". My cards are drifting around this state, too. Enjoying the pottery exposure, of course! But I often wonder if anyone is a would-be Loki, full of mischief. Lately I've had lots of hits daily from what appears to be a beautiful farming area (I looked it up) in Oregon, called Boardman. Each hit is from another originating number. No two alike. Yet all are from Boardman. That's strange! It feels like attempted hackings. If you're not scammers or hackers, Boardmanians, drop us a comment! Same for anyone who knows about this stuff... I'd sure like to know what the heck this is. Posted on March 4, 2018 by Mimi Stadler. One session was about basic thrown lids: drop-in or sit-on-top? Make just an opening in the top of pot or create a gallery (ledge) in it for the lid to sit on? How to measure for good fit? What are the ways to add a knob or finial at the top? One session was about throwing taller: collaring in technique, plus opening and raising the walls 1/3 (starting with top third), then middle third, bottom third last. One session has been about making and attaching cup handles so they don't crack or fall off. All that good stuff. Plus they've been absorbing handbuilding method tips, like texturing possibilities, how to join parts and finish edges, and how not to cause a flat object to warp... yes, all that good stuff. Full speed ahead! Posted on February 27, 2018 by Mimi Stadler. Consider it Your Local Craft Show! Customers both regular and new, you are hereby invited to see what it's all about at the gallery, most weekdays and Sundays of the year! If you can't visit in person, you can browse the Website. Best of all, there is plenty of new work for wedding, engagement and host/hostess gifts in a large range of prices. I also have a few "nice seconds" (there are sometimes a few in handcrafted work which are a little less than perfect), which are discounted to fit most budgets. Of course, you can usually check with me and come by when I'm here working, most weekdays all year, from 10 a.m.-6 p.m. Call (908-354-7799) or text (not call) (732-492-8558) to visit. Posted on February 22, 2018 by Mimi Stadler. Make the pots. Let them firm up a bit. Etch lines in them as desired. Lay color into the lines. Clean up surface as required. Bisque fire, clear glaze, glaze fire. Time it took to write this: a minute. Time it took to learn to make the pots and do these li'l tricks nicely: 33 years. Posted on January 17, 2018 by Mimi Stadler. I use a bunch of different forms made of glass, plastic, plaster, wood and bisqued clay that I use as "hump molds". Those are forms I drape soft clay slabs over to make vessels. A few days ago I made a small group of smallish bowls with "flying handkerchief" edges using glass bowls and an oval ice cream dish as my hump molds. You need to spray glass forms with WD40 lubricating oil before putting clay on them, or the clay will stick. Or you can powder them liberally with corn starch and hope for the best. Well, I made a narrow oval bowl I loved, with an oval foot and those flying handkerchief edges at the rim. But I had not sprayed enough WD40 on the hump mold, so it tore a little when I tried to lift it off. OK, a loss, but one that got me thinking, which is what losses make me do. I had watched Shoko Teruyama create a hump mold at a Women Working With Clay Symposium a few years ago. She makes a solid form and hollows it out. Not a new idea, but watching the care she takes with hers was inspiring. She will use these many times, in effect living daily with them in the studio. So she makes them as attractive and well formed as she can. There is nothing slapdash about her process- even on infrastructure forms that are not the finished pieces but will be used to MAKE the pieces. I did the same this week, thinking also of how long I hope to have these as part of my studio infrastructure and how often I hope to use them. I spent about five hours making them with care. Initial solid humps of clay, basically patted into shape and groomed around the edges. Starting the hollowing process, leaving two ribs across. Continuing the hollowing out. Ribs are structural support as well as handles. They look like little rowboats. This is the underside of 3 finished hump forms. I first shaped the basic humps the day before, and left them out overnight on a plaster board to reach the state where they would hold their forms when carved. The clay was kind of firm when I carved it, about like a block of cheese. I don't know how Ms. Teruyama feels after making these, but I had a pretty good charley horse in my arm a few hours later. I had removed at least 11 lbs of clay, scrape by curling scrape of the sculpture tool. When they are turned over, they look pretty much as they did before I began the hollowing out process. But they are light enough to handle while I'll use them as forms to drape clay over. They have to now dry s-l-o-w-l-y, lightly covered with dry-cleaner thin plastic. The walls vary from place to place from 1/4' to 3/8", which could stress these pieces as they dry and shrink unevenly. I don't want them to crack. I'll show you how I use these, after they go through the bisque-fire that makes them permanent. Posted on January 2, 2018 by Mimi Stadler. Date Night or Friends Night! 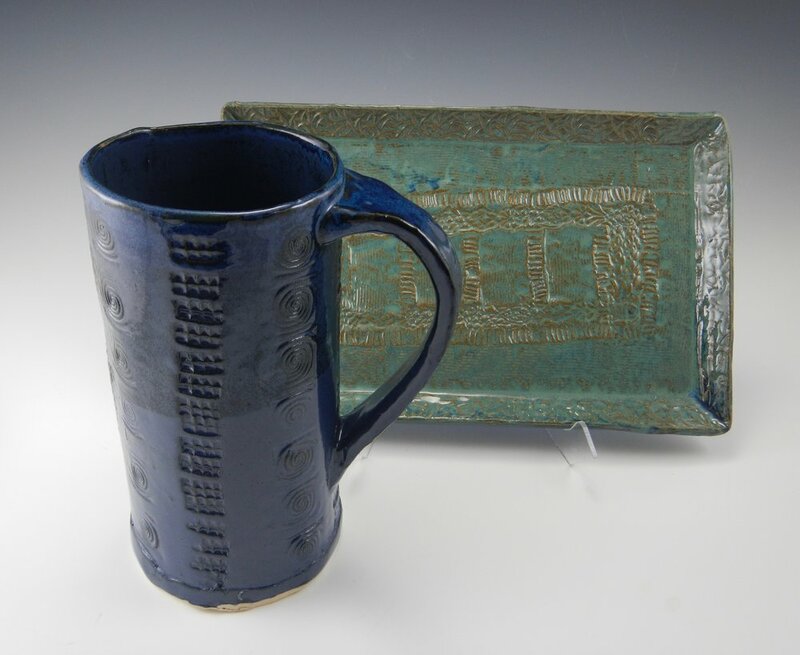 Sign up now for a Date Night or Friends Night at Mimi Stadler Pottery studio, Saturday nights, beginning October 21! Dress down to get a little messy, BYOB, and have fun! Two hours, all materials supplied, $60 per person, 2 person limit. Contact me to schedule, or text or leave a message at 732-492-8558 and let me know how to reach you. You can ask about up to 4 people in case that becomes available. 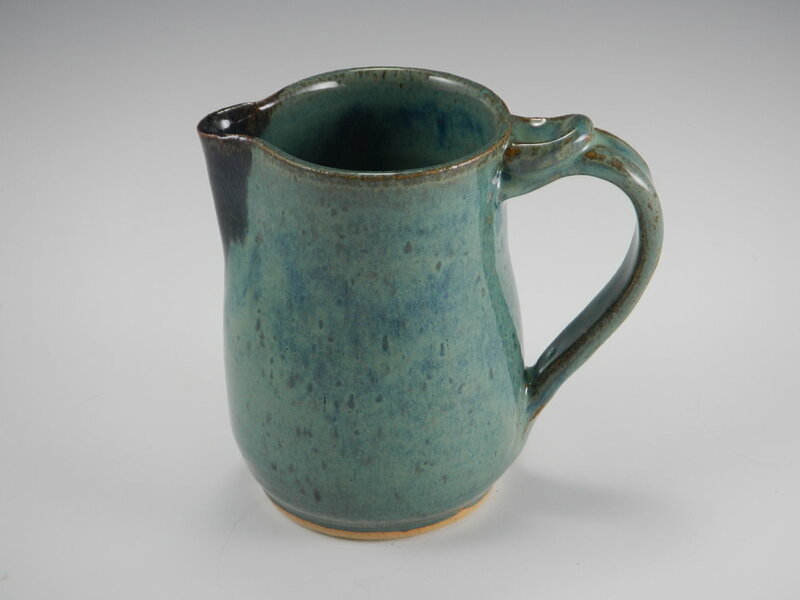 Julia Galloway's professional life both as teacher of ceramics at University of Montana and as clay artist are thoroughly thought-out and intelligently practiced. She has worked hard in a field that requires hard work and a strong personal vision, to really shine. Attending her presentation, I was delighted to listen to her because just as she has a way with clay, she has a way with language. Julia talked about the relationship of surface and form, and the development of her own ideas about that. Then she made a list on the chalkboard of 8 forms she would make for us over Tuesday and Wednesday. They were: pitcher, 2-lb. ewer (I think that's what it says! 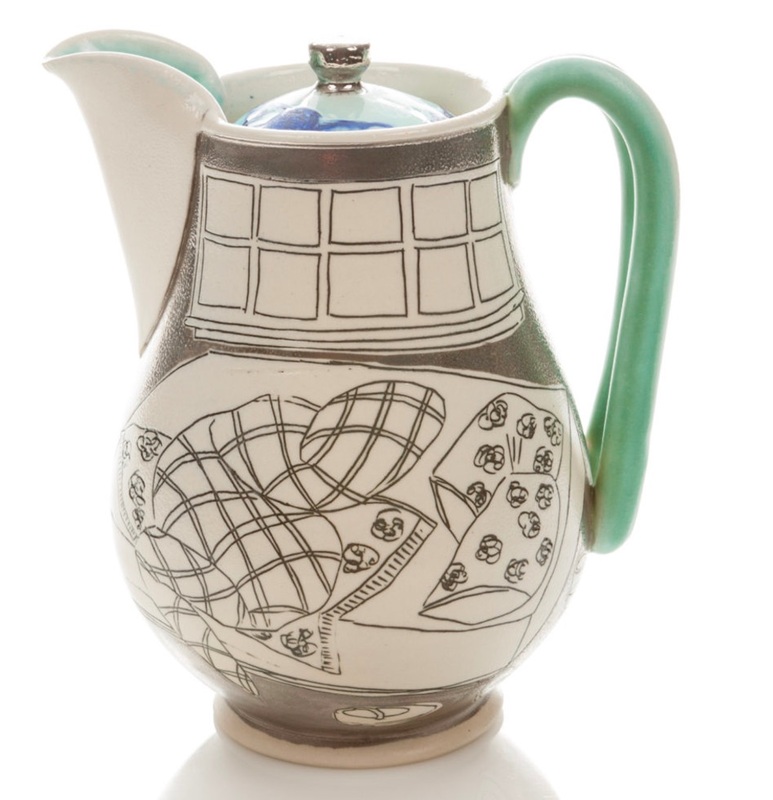 ), 4 cups, salt & pepper shakers, water ewer, sauceboat, teapot and mug. These did get made, and different handles and handle application demonstrated as well. (I was there for her "celery" style handle, which I am going to try, it's so great looking.) And it was really fun to watch. I'm a thrower, and watching a master throw and take apart and reassemble parts is always riveting. These 8 forms got made with various considerations of shapes and gestures, and best placements of handles for each piece that was getting a handle. Each was intended to get its own surface decoration. A potter who challenges herself to fulfill different ideas while maintaining a clear artistic voice is a very interesting potter. Many aspire. Julia is interested in form. "Form is about your body", she says, vs an intellectual idea removed from that. She has worked up a routine, in which she develops an idea, then mounts an installation that works around that particular idea in a gallery. "Figuring out some way of installing pots that support that idea" is, in simple terms, how she does this. It takes her 3-4 years to put together a whole installation. The space itself helps determine how many and what size, and whether to hang some (i.e. her Clouds installation, http://juliagalloway.com/sky-vault-2012.html), and in what configuration the pieces will be shown. Julia talked particularly about one installation, the John James Audubon birds that she drew on cups, one type of bird per cup, celebrating Audubon's entire collection of bird paintings. She talked about the inspiration she drew from how, as he approached the end of his life, Audubon began drawing with both hands, trying to get the whole body of work completed as quickly as possible as time ran out. The decoration on the surfaces starts with the kind of drawing that is made by a pointed tool pulled or pushed along, etching the leather-hard clay, like a drawing by pencil or brush except incised. She applies color in media like slip or underglaze or oxide mix over the area of the etched drawing, then wipes it back with a sponge so it remains only in the etched lines. Other areas will have glazes on them after the bisque, possibly over drawings as well that might not be incised but might rather sit on the surface. Luster might be added in an additional fire. Here is a coffee or tea pot from her Dreaming and Daily Life installation, showing the development of a theme on the surface of one of her pieces- in this case a window, over an unmade bed, complete with a shoe sitting on the floor. Additional glaze areas are on the handle, in the spout, and on the lid, which is complete with a lustered knob. To do her work justice, please spend some time with Julia Galloway's website. It's well worth the time spent browsing. Posted on July 11, 2017 by Mimi Stadler. Patti Warashina began her life in art studying painting, "lots of it", as she says. When she began with clay, in the 1960s, she wanted to figure out how to build sculptural objects by hand. She found that her knowledge of sewing patterns could be translated into making patterns for clay. She felt that really helped her jump into controlling the material. Because of all her drawing experience, she learned to use the human figure to express ideas. The first thing she made was in fact a human figure- on a clay pot. That morphed into giant lips on pots. There, she was in tune with clay moment in art that had begun with Peter Voulkos and John Mason, change that continued foment with work by Robert Arneson and his Funk Art movement, which included David Gilhooly and Ken Price, among quite a few others. She was alive to the working moment espoused by these people, who were radically changing the face of modern ceramics. It was a heady and freeing time to work with clay, moving away from vessels snd towards personal expression of a different kind. Being a woman in a sexist academic world and art movement did not bother her much. Ms. Warashina was and still is a go-getter, from her reminiscences as she worked at the symposium. 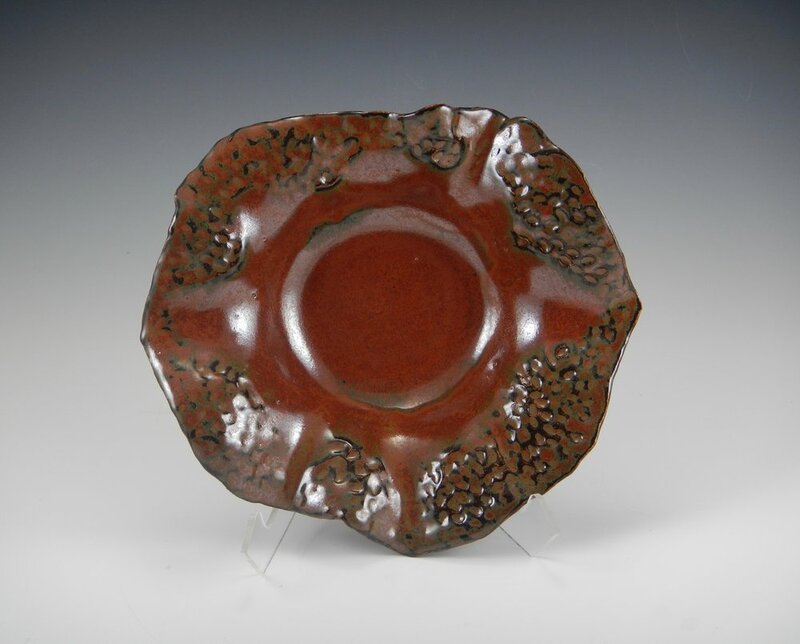 She found that stoneware materials and firing temperatures in the 60s made it hard to keep oxide decoration (the then-current method of decoration on clay) from running and blurring with the melting glaze. (Only chrome stayed in place, which is a very limited palette indeed.) She really wanted lots of color. 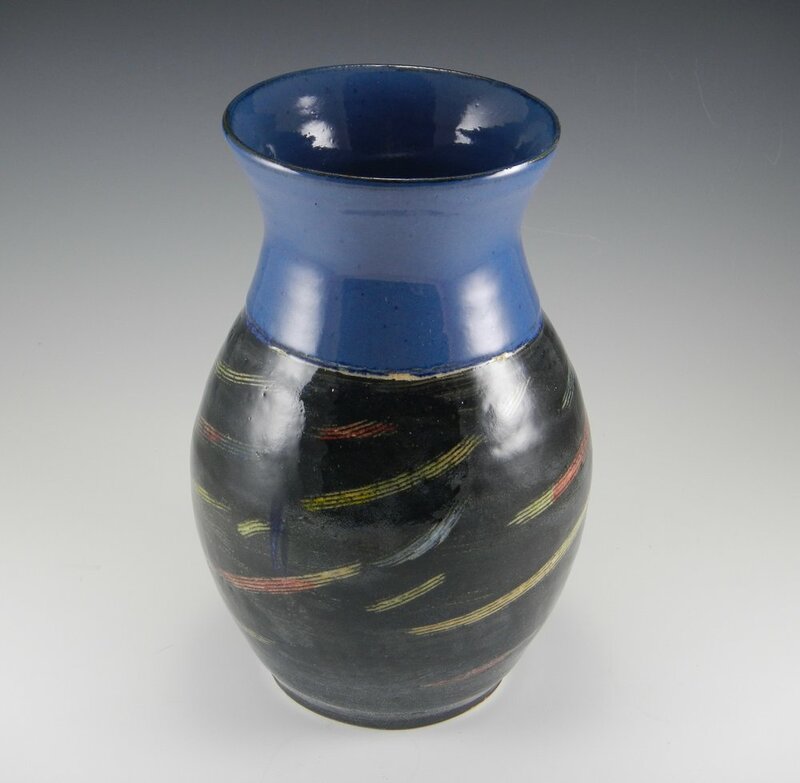 Those clay luminaries of her early years, the Funk Art clay folks, had begun using new low-fire commercial glazes on the clay, and china paints, and "cold" finishes like paint, bursting through the previous high-fired palette with great attraction for Pat. Learning, usually, when challenged by something (like those runny oxides), she adapted, and now she adopted those bright colors that stayed put. As she worked, she found that figurative proportions could be played with; people would still understand what they were seeing if, for example, arms and legs became disproportionately small or lips disproportionately big. She has played with that ever since. If her animals were somewhat human-like and her humans somewhat animal-like, what difference would it make? It's all in service to a bigger idea for each piece. She shrugs off the words "craft" or "art", saying it is not important what to name it. The medium draws her back repeatedly. "There's always something there that keeps dragging me back into it." She continues, "The hardest thing...is thinking about ideas. If I can figure out the idea, I can figure out how to build it... Clay, I like the permanence of it." It is different from other media. She likes "that fired quality." Warashina makes large molds to facilitate assembling the parts of her sculptures- just as she made sewing-type patterns earlier. Casting the forms or pressing them into the mold parts greatly aids in making the sculptures as thin as possible. First she draws her conception of the piece from various sides, then makes the lightweight mold from what appears to be fiberglass and plaster (which I believe is modern medical-cast material). As she talked, she built this cat (above). Recently, social justice projects have become increasingly important to her. Making objects, she says, is not enough any more. She is interested in "marrying craft and social justice in some way." I hope to see that. Posted on July 10, 2017 by Mimi Stadler. There were four great presenters this year at the Women Working With Clay Symposium (Roanoke, Virginia, USA, June 12-15, 2017). I didn't always know who to watch and hear next. I hated to miss anything at all. All four presenters this year were in one, very big L-shaped room. The two throwers, Ayumi Horie and Julia Galloway, were in one leg of the L; the two sculptors, Patti Warashina and Gerit Grimm, in the other. How should I have chosen? They were all doing work I wanted to see, and I hated to skip a minute of any. But short of cloning myself, not my forte, I had to hang with one pair at a time. We could go up and take photos of the presenter or the work, or both together. It was structured to be informal and they were so amenable. People asked plenty of questions and shared their own thoughts, and that was welcome too. I've been to four of these symposia now, and the format has been one where attendees and presenters alike could feel comfortable and open. That the 70 or so attendees were double the number of the other years I was there, was possibly because of the stature of all of these particular presenters. There were no relative newcomers presenting this time (although when there have been, they've been able to carry the load). Through dint of hard work, teaching, giving workshops and talks, through social media, and because of their personalities, they are all pretty hot stuff in the ceramics world now. The organizer, Donna Polseno (artist, teacher, organizer, former presenter on at least two occasions) selects them through some mysterious process that brings out the best of the best. As in previous years, when I begin to write about this symposium for readers of my blog, everything I've experience over those few days (there's so much) needs thought and structure to really get down "on paper". Some of what takes place at the Women Working With Clay Symposium strikes sparks that need some really good mulling over. Because the symposium is small ("huge" this summer, with 70 or so attending), there's no bad vantage point to watch presentations. You can easily hear the presenters as they talk while working (or as they pause their work to expound), and clearly see how they go about making particular parts and pieces in their repertoires. They're taking questions and telling about their work processes and philosophical and business perspectives. So I've been gathering my notes from the Women Working With Clay symposium and also- this is inevitable- thinking about my own professional practices in and out of the studio. As part of this, I've been making design notes for my two currently most interesting projects. Tweaking designs; thinking through forms and decoration yet again. This symposium is a perennial kickstarter for my summer and fall studio. So while I am not at home in NJ, but in Maine on a lake for a little while before plunging back into the business and pleasure of clay, I'm taking in the view and sorting out how to do the symposium justice as I write about it. I think I'll present the presenters... one by one. Posted on June 18, 2017 by Mimi Stadler. I'm at the Women Working With Clay Symposium at Hollins University in Roanoke, Virginia, June 12-15, 2017. Been here about 5 times now and I've never been less than buzzing with everything going by the end (heck, by the middle) of each day. I don't think it's possible to be underwhelmed. The presenters are powerhouses. There is so. much. to. absorb. Techniques. Ideas. Conversations. Discussions. I almost can't take it, it's intense. So many potters to talk to- but with about 70 of us, it's not overwhelming like the experience of NCECA can be for a friendly introvert (can that be a thing?) like me. Posted on June 14, 2017 by Mimi Stadler.